Origami swords are easy to make from paper rectangles, and they are one of a number of fun and interesting origami weapons. You can also make this origami sword using a dollar bill. To make an origami sword, select a piece of paper that is twice as long as it is wide. The sample used in the photo is eight inches by four inches. If you are using traditional square origami paper, tear or cut it in half. Fold the paper in half using a valley fold. The center crease will work as a guide for future folds, so make sure that you've creased it well enough to see it later. Fold the long left edge of the paper toward the center fold and repeat on the right side. Press firmly in place. Note: Your future folds will always have the center seam with the two adjoining edges of the paper facing up, just like in the photo. Make a fold from the top edge a quarter of the way down. Now fold that quarter section again, creating an additional half inch pleated fold. You now have three sections that are three different lengths. With the split side of the paper facing you, pull the edges that comprise the smallest section toward the center using a squash fold, wrapping and creasing the top section as you go. Try to fold a full third of that section in toward the center. Repeat on the other side. The goal here is to reduce the width of the top section to create the hilt (handle) of the sword. You'll know you have it right when the opened portions of the small fold looks like two triangles side by side at the base of the narrowed top. At the end of the long section, open the folds and turn the left edge down along the center seam. Repeat on the right side. This portion will be the point of the blade and will look like an arrow when the two folds are completed. Now fold the two outermost flaps back into place. Working on the hilt again, fold the doubled section with the triangular folds up toward the sword tip. The fold should be the same thickness as the original small fold. Now fold it again, this time in reverse. The split side of the blade should be facing you. Now you have a double fold like the one you used to create the hilt. Repeat the process you used to create the hilt by drawing the small pockets on each side of the small fold in toward the center, reducing the width of the sword's blade all the way to the tip. Press the folds firmly in place. Turn the piece over and you will see your completed project. This easy project can be made with larger paper sizes than shown here, but always use a heavy weight paper in order to support the length of the blade. Want to make some more great weapons? 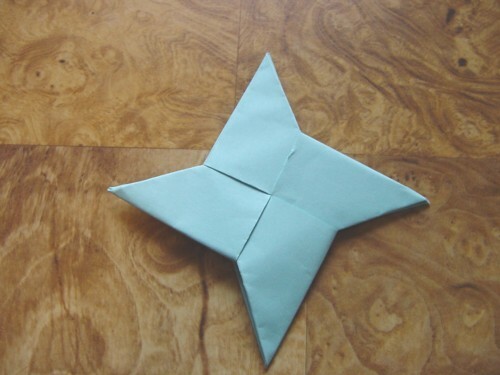 Try an origami throwing star or a life sized origami pistol.